As far as scooters go, the Piaggio BV350 i.e. had me pretty excited. The reasoning is simple: its 330cc engine is the largest in this class (I don’t include the Suzuki Burgman 400 due to its maxi-scoot size and price), and Piaggio’s marketing materials highlighted it as being the best of both words – having the power of a bigger scoot with the maneuverability of a smaller one. If I may make this stretch of a comparison, the BV350 has a similar charm as the Suzuki GSX-R750 in that it feels like a hot-rodded version of a smaller bike without the restraint required on a bigger one. Once I hopped on the BV, my anticipation was only partially justified. First off, the BV’s engine definitely met expectations. Despite being labeled a 350, the displacement is really only 330cc. Still, the 4-valve, SOHC, liquid-cooled Single has more guts than the recently reviewed Kymco Downtown 300i, Honda Forza or SYM CityCom 300i. The difference is something you feel from the saddle. Piaggio says the BV makes 32.8 horses and 23.8 lb-ft. at the crank. Both are respectable numbers in this class. Our BV350 tester came from Piaggio with the “NYPD setup” that didn’t include the windscreen as usually delivered standard. For 2015, BV350s are available in Nero Carbonio (matte black) and Bianco Stella. Piaggio claims the BV has a top speed of 86 mph; I only had enough California freeway available to reach an indicated 83 mph. That’s plenty of power to hold your own on the highway, but considering the time it takes to get there, maintaining momentum is key. I had hoped for a little more top-end punch, but with 330cc and 400-plus pounds, that was a bit unrealistic. When cruising at these speeds, it’s best to leave the aggression behind and just enjoy the ride since passing power is limited. Our particular tester was outfitted in NYPD trim, meaning it lacked a windscreen and got the all-black treatment. While that may look stealth and work for police duty, the missing screen meant freeway blasts – something NYPD doesn’t have to deal with – were kept to a minimum. To their credit, the 110/70-16 front, 150/70-14 rear tires track fairly well, without the tendency to follow grooves in the road. A single 300mm disc and two-piston caliper takes care of stopping duties in the front. Braking power feels strong enough, and combined with the 240mm rear disc, brings the BV to a stop quickly. A fine errand runner, the BV hits its stride when the tasks involve zipping around town. A 31-inch seat height is fairly tall, but the reach to the ground isn’t bad thanks to a seat design that narrows towards the front. The 2015 seat is re-contoured slightly from the 2014 and eliminates the back pad not seen in our NYPD-trimmed tester. Once opened, the hinged seat flips toward the front – as opposed to being raised via a strut – making the underseat storage area easily accessible. If you’ve a small head, then your full-face lid may fit under there (assuming it doesn’t have any oddly shaped vents or such). Otherwise, the space is best left for ¾ helmets or less. There’s also room to toss your jacket or handbag under there as well. Considering there are other scoots in this class with more underseat room, this is a small drawback to the BV. In an urban environment, the BV becomes really useful. Its plentiful bottom-end power makes it easy to zip away from traffic at stop lights, and its narrow profile allows lane filtering without hesitation. 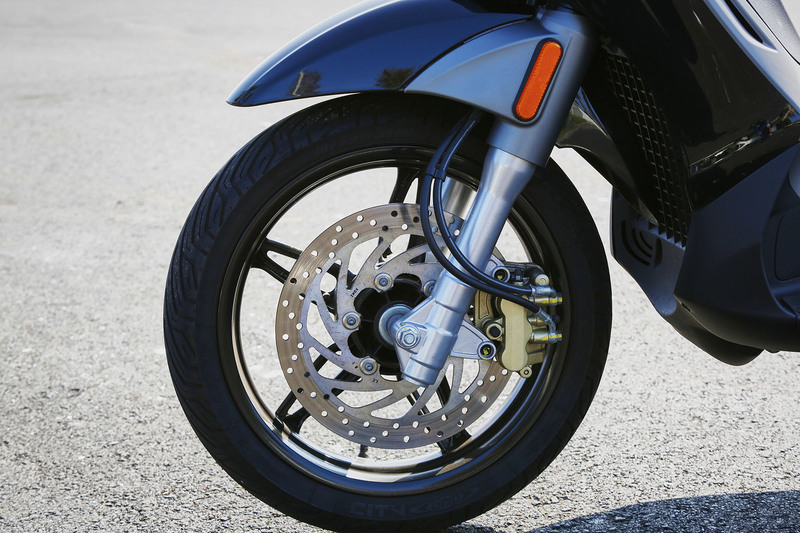 Ride quality is geared toward the comfort side of the equation via a 35mm fork and twin shocks, the latter adjustable for preload. The best engine in its class helps propel the BV350 into a great city scooter. Pun intended. Moving the Piaggio where you want it is easy enough, as the bars provide decent leverage, and the tall-ish seat means a rider’s body weight has a big influence on the bike’s handling response. Then again, the BV350 is definitely not a sportbike and never claims to be. The BV350 doesn’t feature a traditional step-through design as, say, its sister brand Vespa, but it’s close. 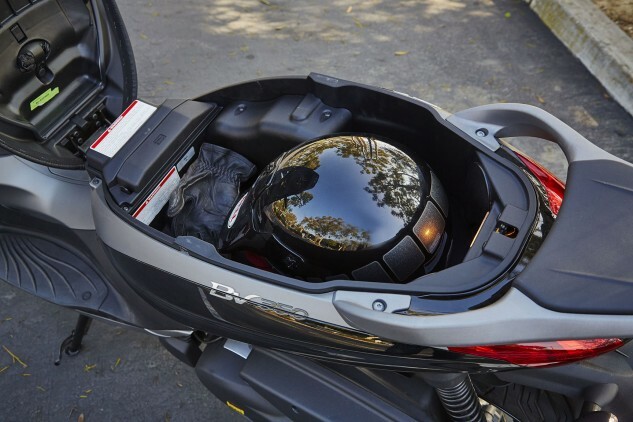 There’s still a neatly integrated bag hook in the leg shield, adding to the scoot’s versatility, and if you key on the ignition and then give the key a firm push down again, it opens a massive cubby space just below the bag hook. In it, there are two large storage compartments, including one with a 12-volt power outlet. Between the two is a smaller pocket, ideal for keys, wallets, phones, etc. A front-hinging seat makes the storage compartment readily accessible. There’s only room for one helmet, but note the little pouch underneath the seat itself (above the green sticker). That’s a waterproof cover for the seat, another nice detail that helps separate the BV350 from the rest. It’s this attention to detail that makes the BV350 an impressive scoot in the class. At first glance, it appears like a featureless scooter that relies on the power of its engine to please its rider. 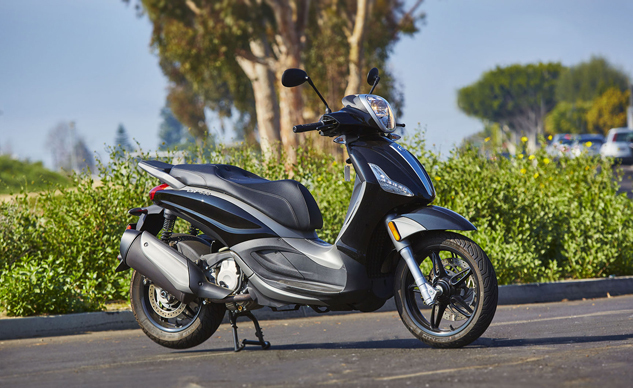 Storage space isn’t immediately visible like it is on Piaggio’s Asian scootering counterparts, but once you push buttons and turn keys, it becomes apparent that in fact these features are included. In fact, they’re integrated in a much cleaner fashion than that of the Honda, Kymco or SYM mentioned earlier. 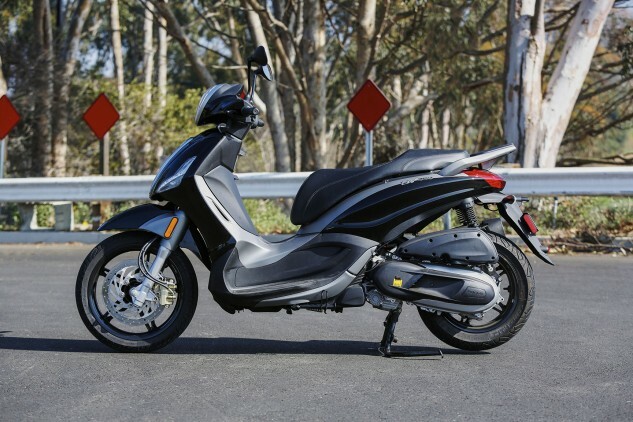 At $5,899, Piaggio’s BV350 i.e. 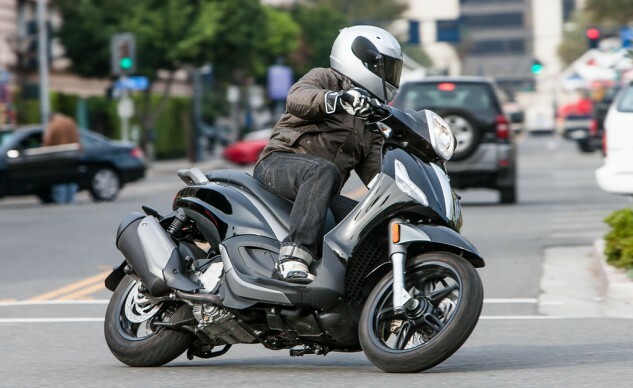 is only $300 more expensive than the Honda Forza and Kymco Downtown 300i. While it lacks some of the storage space of the other two, it makes up for those faults with greater power and a clean, thoughtful design of its components. If you’re shopping in this category, it’d behoove you to consider spending those three extra Benjamins, plus a little extra on a top case, for the ultimate in city scootering.